Life with a rock star | Kate Mahar writes . . .
Well, it’s started. Mick Jagger the Rock Star Dachshund is heading into his teen years and as a budding rocker, we had our first incident this morning with drugs. As I was opening my bottle of Zoloft, the bottle slipped from my hand and little blue pills rained down on the kitchen floor. Expecting a treat (of a different kind? ), Mick dashed over to help himself to the goodies. Although I did my best to keep him away, he crouched down a few feet away and appeared to be snacking on something small. I immediately called the vet’s office – which was still closed – and in turn called an emergency number on the answering machine. I spoke to a local clinic which then gave me the number of the ASPCA 24-hour drug hot line. Incidentally, should you need it for your wayward pet, the number is 888-426-4435, I do pray that the heartbreak of pet drug abuse doesn’t visit your home, however. For a $65 consultation fee, I learned from the very nice people at the ASPCA that Mick might feel drowsy and experience some vomiting this morning, but happily, the pill that makes ME, um, happy . . . will not metabolize in a dangerous way with Mick’s little 20 lb. body. If he was hoping for a good time, the Zoloft ain’t gonna provide one. I did have to cancel a Saturday breakfast with the girls to keep an eye on the pooch for a couple hours. Mick appears to be passed out on his comfy pillow at the moment. Since that’s usually what he does after our morning walk, I don’t know if he’s drowsy from the drug, or just being his normal doggy self. I wish I could say this dog learned his lesson, but you know how rock stars can be. I suspect that given another opportunity, he will experiment with any drugs that come his way. If it hits the floor, it might be food. If it’s food on the floor, it must be HIS. That’s how Mick sees it, I’m pretty sure. I will do my best not to put temptation in his way ever again, but I’m afraid he’ll be right back at it, given the opportunity. Just say no, Mick. Just say no. 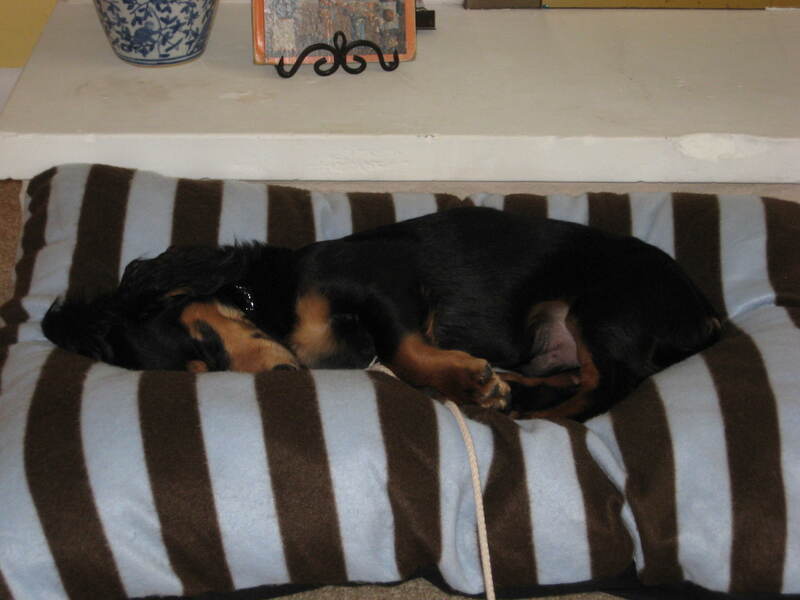 This entry was posted in Uncategorized and tagged dachshund, dog, drugs, rock star. Bookmark the permalink. Ah, but I think he already has a habit…remember the aspirin bottle he chewed when I puppy-sat? It was in Chris’s bag on the floor? This could be serious but rock and roll stars don’t do well in rehab. Let’s set up an intervention with Little Richard, Curly (of Larry and Mo), and any other celeb dogs we can locate. Those rock stars are ‘high’ maintenance. Hope he is okay! Thanks, Mary! He’s doing fine!